Thursday night the boys and I drove to Logan, Utah to spend the weekend with my sister, Katie, and her family. We left Kevin at home so that he could work on his final project for school (a draft was due today). It was so fun to be able to get out of Pocatello and spend time with family. 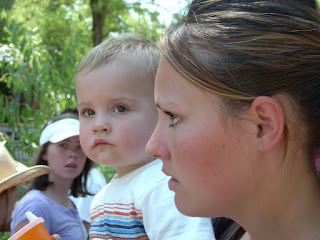 On Friday we drove to Salt Lake and met up with Melissa and her boys at Hogle Zoo. I must give props to all mothers who take on this adventure with kids and no spouse. It's a lot of work and I only have two kids (and one was strapped onto me the whole time). We did have a good time and we were even able to get seats to see the elephant show. After the show we went to TGI Fridays for lunch. Then on Saturday we spent most of the day outside. We were able to sneak a little bit of shopping in and went to a park. 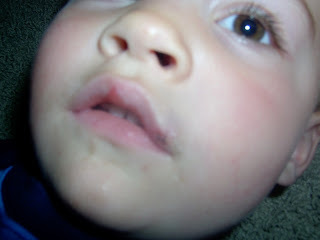 We had great plans of dinner and a movie (Alex was going to babysit for us)...until Owen fell off his chair and put his tooth through his lip. Good thing Katie was there! I didn't know what to do and ended up in tears on the way to the ER while Owen (he was asking me "you okay mom?") and Katie were trying to comfort me. 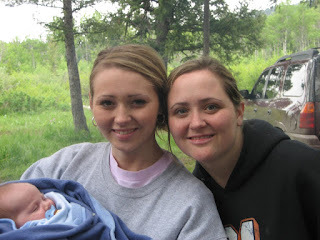 But, once we got to the hospital I was able to gain composure and be the "mom" again. 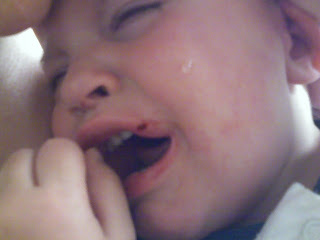 After three hours, two phone calls to Kevin, two stitches, and two Popsicles we were back at Katie's and ready for bed. 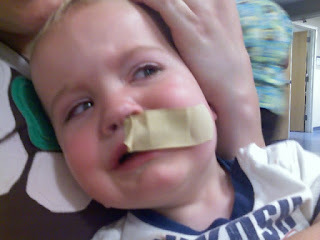 Owen and his band aid. Two stitches. He was so brave. 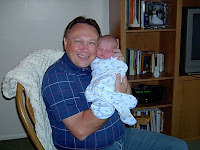 I know that Father's Day has come and gone...BUT, I never got a chance to blog on how much I love the fathers in my life. Happy Father's Day! We love and admire each one of you. We are lucky enough to have men in our lives that are such great examples of patience, hard work, dedication, and sacrifice. I am truly thankful every day for the things each of you have taught me and the ways you have blessed my life (and my boys)! 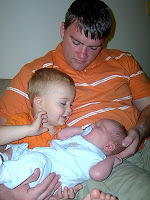 Kevin with Owen and Wes. Boy, I hope I got this right. I believe that today is your 28th birthday. Can you believe it? That seems so old. I pulled together some pictures that I have of us together. It brought back lots of memories. 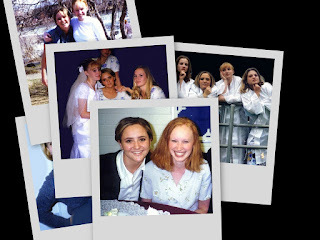 We have been friends for a long time (since elementary school) and I truly value our friendship. I am so glad that we have been able to keep it alive after all these years. So here's to you, fellow blogger! Happy Birthday! 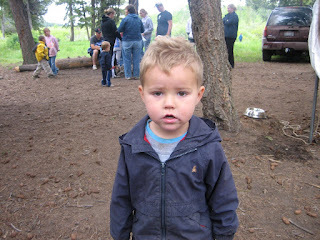 Hope to see you soon..
Last weekend was our 6th Annual Gregg Manwaring Family Reunion. It was Ben and Kaylin's turn to host so of course we found ourselves camping out in the middle of nowhere for the weekend. Although, they did have a very beautiful camping spot picked out in Kilgore, ID and Ben was kind enough to build us a latrine out of wood and a tarp. Being the wimpy camper that I am (every since I camped in Logan Canyon last year and had a run-in with LARGE mysterious animals) I found myself and Wesley sleeping in cars both nights. But, I still had a good time. 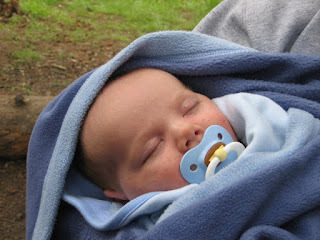 And little Wesley was the most content camper there. He was constantly being held. We all arrived (all 34 of us) on Friday afternoon. We set-up camp and just spent time around the campfire eating and talking. 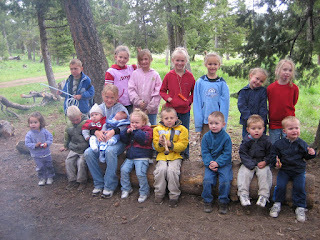 On Saturday we went for a hike to Aldous Lake and when we returned Kaylin did crafts with all the little grandkids. Then on Sunday we had breakfast and a nice devotional and packed up (shortly after it started raining) and headed home for lunch. Ben and Kaylin did a spectacular job! We are already looking forward to the reunion next year. Since Owen started sleeping in his "big boy" bed I like to check on him during naptime to make sure he actually fell asleep in his bed and not on the floor next to the door. Well, yesterday when I went to check on Owen and I couldn't find him. Then when I closed the door behind me I found him tucked behind the door between the wall and the hamper. 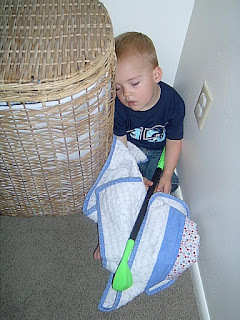 He had fallen asleep sitting up with his golf club and blanket. So pathetic...but still so cute! Owen loves to play with his cars. I had to blog these pictures so Grandma and Grandpa Ward could see how much Owen loves the cars they gave to him during their visit this spring. 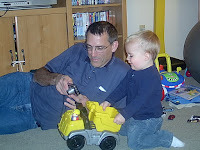 He moves all over the house with these cars and they never grow old (thank goodness). 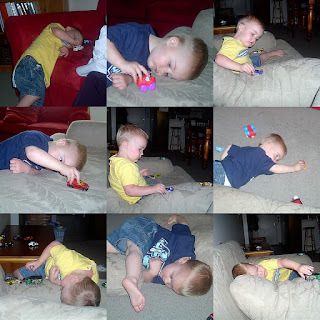 It's so fun to watch him drive and park them all over the furniture (a blossoming imagination)! So, thanks again Grandma and Grandpa! 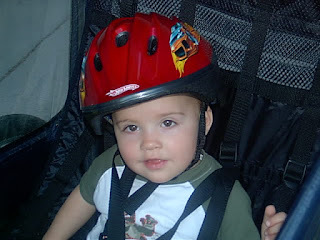 Last week we went and got Owen his first bike helmet. 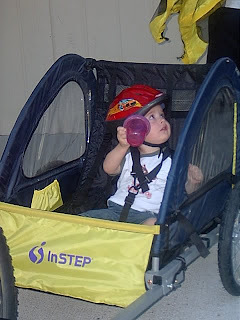 He looks so darn cute in it I had to take a picture of him before Kev took him for a bike ride. 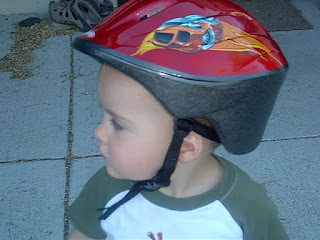 He really wouldn't hear of putting it on until he saw Kevin put his helmet on...then there was no question as to if he would wear it. He loves his dad! Happy Birthday (yesterday) Sam! I was doing so good on posting family members on their birthdays until I let yesterday slip past without wishing my brother-in-law a happy one! Sorry Sam! Anyway, we hope you had a great day. 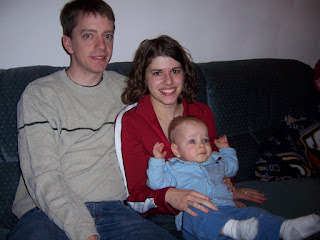 We also hope to see you and your little family soon. Sam the day before his wedding.